It’s hard to believe that after 60 years of tradition that the Los Angeles Dodgers are going to take their Spring Training show to Arizona. For thousands of fans who have experienced the sights and sounds of the spring, Dodgertown has been a must-visit stop. It wasn’t just baseball; it was a way of life in Vero Beach. For so many who’ve seen it all, there life is about to change. But I guess that is inevitible. It puts a great many things in perspective. And it got me thinking…. So what was going on in 1948, when the Dodgers settled in Vero Beach? What did things cost back then, I wonder…. There is a special aura of the all-time greats who’ve been regulars at Dodgertown over the years. Think about the names: Jackie Robinson, Duke Snider, Roy Campanella, Don Newcombe, Gil Hodges, Sandy Koufax, Don Drysdale, Steve Garvey, Don Sutton, Ron Cey, Walter Alston, Fernando Valenzuela, Orel Hershisher, Mike Piazza and so many more. When you come to Dodgertown, you just feel like there is so much history on those grounds. Two such legends were on hand today. Tommy Lasorda is in attendance this afternoon, along with former speedster extraordinaire Maury Wills. We’ve bounced around for the better part of the morning, taking in batting practice, chowing down on Dodger Dogs and getting our first look at Andruw Jones in Dodger blue. The travel team consisted of a very outfield-heavy roster with mostly minor league talent fighting for reserve rolls on the infield. On the bubble, Scott Thorman, Martin Prado and Brent Lillibridge all got a starting roles on the afternoon with a chance to make an impression. Jordan Schafer definitely made a good impression, getting start in center and stroking a pair of singles. Andruw Jones showed considerable patience that many fans may not have thought he possessed, walking twice on the afternoon before being lifted for a pinch runner in the sixth. On the other end of the spectrum, it did not take Jeff Francoeur too long to pick up his first outfield assist of the spring – that came on Jason Repko (who pinch-ran for Jones) and it saved a run for sure. Lost in all the excitement of this trip for me was the fact that the Dodgers do in fact have a new manager. How could anyone forget? Joe Torre is manning the bench this season and has a very talented young squad with a great mix of veterans. This could be your team to be beat in a very competitive NL West. Though a new chapter may be ahead for Holman Stadium and the rest of the Dodgertown complex, it’s strange to think that the team will vacate the facility they’ve called home for more than a decade longer than Los Angeles. As spring training approaches, it is time to take an in depth look at how the Braves are shaping up. Each entry will cover a specific portion of the club with a deeper look at how the positions and the battles to fill those final spots final spots will shake out. When the Atlanta Braves added powerful switch-hitting Gold Glove first baseman Mark Teixeira prior to the trade deadline last season, they knew that their line-up would receive a considerable boost. Now, with the Teixeira in the fold for a full season in 2008, the Braves may boast the most dynamic infield in the National League East. Sure, the Mets have young studs David Wright and Jose Reyes to go along with veteran Florida cast-offs Carlos Delgado and Luis Castillo, but the Braves have plenty of fire power on the corners and emerging young talents up the middle. Chipper Jones has anchored the Braves infield since his rookie season of 1995 (save a brief stint in the outfield). As always, as Chipper goes, so go the Braves. Despite missing more than 30 games, Jones finished just two points shy of his first batting title (.337) while pacing the league in the all-too-important OPS category (1.029). That’s on base percentage plus slugging percentage for those behind the times. Chipper also scored 108 runs and drove home another 102, making him the element that will allow the Braves offense to reach critical mass. In the fielding department, Jones continues to play about as steady a third base as anyone in baseball. He makes all the plays he should, committing only nine errors in 126 games. Compare that to Wright’s 21 in 159 and you start to wonder what is going on with the Gold Glove Award. The Braves are hoping to get a full season from Jones for the first time since 2003. With the departure of long time partner in crime Andruw Jones, Chipper will need to put up strong numbers again if the Braves are to have any chance of keeping up in the East race. Atlanta has placed its hopes firmly on Jones being able to remain in the line-up, dealing away starting shortstop Edgar Renteria so that young stud Yunel Escobar, who backed up all over the infield, could assume the starting duties at short. The Braves also dealt away two-years ago’s Jones stand-in, Willy Aybar. Teixeira’s bat will no doubt make a huge difference over the course of the season. Last year marked the fourth consecutive season in which the former Georgia Tech star surpassed 30 homers and 100 RBI. In fact, in 54 games with Atlanta, Teixeira belted 17 homers drove home 56 runs while slugging at a cool .615 clip. Prior to a calf injury that cost him 30 games last season while with Texas, Teixeira had played in 162 games in each 2005 and 2006. Off-season knee surgery for Teixeira went just as planned, giving him plenty of time to ready himself for the season. Without Andruw, the Braves are hoping that their new clean-up man can recapture the success he enjoyed in ’05 when he hit .301 with 43 homers and 144 RBI. Escobar, 25, surprised everyone and no one all at the same time last season. Braves skipper Bobby Cox already knew that they had something special in the Cuban defector, but did not necessarily expect to see him displacing Renteria. Escobar’s exciting play made the Braves comfortable enough to part with top prospect Elvis Andrus and later Renteria. Serving as a super-sub of sorts, Escobar launched a full-tilt assault on the rest of the league. In 94 contests, he hit .325 with 25 doubles, five homers and 28 RBI. Escobar’s heads-up style on the base paths made for many exciting moments, including his stolen base against then Arizona closer Jose Valverde that occurred while the hurler bent down to tie his shoe. Reaching base wasn’t a problem for Escobar (.385 OBP) so Valverde may not be the last pitcher to suffer some embarrassment on the base paths. All the tools are there at Escobar’s disposal. His strong accurate arm and solid range will both be on display in his natural position this season. At the plate, his opposite field approach echoes of Renteria and compliments his keen eye in using the whole field. Escobar’s power is still coming along, but it wouldn’t be surprising to see him poke a dozen or so homers. When the Braves decided to let long-time second baseman Marcus Giles leave via free-agency and go with converted outfielder coming off Tommy John surgery in Kelly Johnson, some experts thought they were crazy. Johnson’s work with the bat this season pointed to the bigger picture while his fielding continues to come along. Johnson turned in quite a solid all-around season in 2007, hitting .276 with 26 doubles, 10 triples, 16 homers, 68 RBI and 91 runs scored. By drawing 79 walks, Johnson was able to turn in a better-than average .375 OBP in his own right. As he continues to learn the position, Johnson should become more adept at making the play to his right, which was the cause for many of his errors a year ago. The Braves expect more of the same from the patient line-drive hitter this season. Serving the Braves behind the plate is the ever-popular young catcher Brian McCann. The Braves felt so strongly about the Duluth-native that they inked him to a six-year contract last spring after his All-star season of 2006. Though the average dipped from .333 to .270, McCann fought valiantly through ankle and hand troubles that nagged him for most of the season. The NL again gave McCann the nod to join the All-star squad, despite just a .262 average and nine homers at the break. But as the weather heated up, so did McCann, hitting .289 with 10 of his 17 homers and driving home 41 runs in July and August. McCann finished only two RBI off his pace from two seasons ago (with 92). If you were looking for timely run production, 41 of those came with two outs. Though he did finish a few homers shy of his 24 two seasons ago, McCann upped his doubles total to 38. A full off-season of rest should have McCann healed up and ready go as Grape Fruit League action begins. There’s a certain level of excitement for a player who joins a winning franchise that could be on the cusp of a promising season. Mark Kotsay goes from a team committed to a youth movement to joining a club with a strong history of winning. "You’ve got to be excited to come to a winning ball club, a great tradition," said Kotsay. "I came through here in ’96 with the Olympics, played in the old Fulton County [Stadium] and I look forward to playing in the new one." Of course, "the new one" would be Turner Field, home of the Braves since the 1997 season. Much has changed since Kotsay’s days in the summer 1996 and even his stints with both the Marlins and Padres. That same season of 1996 marked the year that Andruw Jones made his Major League debut and began carving out a legacy built on excellence in the outfield. With 12 years passed for both men, a new chapter begins in earnest for Atlanta in center field. It comes as no surprise that the immediate storyline many want to follow is trying to determine how Kotsay feels about replacing a player who was, and will always be, an Atlanta legend and fan favorite. How do you properly answer that question if you are Mark Kotsay? Easy. "You can’t replace Andruw Jones," stated a very frank Kotsay. "I’m not here to replace Andruw Jones. He’s an elite outfielder, he’s an 11-time gold glove winner. That’s all that needs to be said." By side-stepping the landmine of the potential distraction that would come with dwelling on the fact that you are expected to "replace" perhaps the greatest fielding outfielder in the game’s long and storied past, Kotsay has made a wise move. 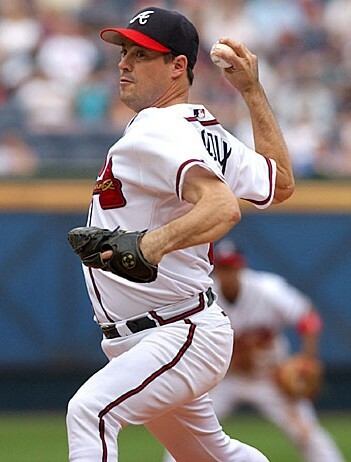 Honestly, no one from Frank Wren to Bobby Cox expects there to be a seamless transition from Jones to Kotsay. What the Braves are aware of is that they picked up a hard-working, slick fielding, line-drive hitter who will bring a veteran presence to younger more inexperienced outfield. A healthy Kotsay can more than fill in, he could be a big contributor. Health is priority number one. "What we’ve seen so far is real good," said a pleased Cox, adding that the team will occasionally give the veteran outfielder a day off here and there to keep him fresh throughout the spring. Couple him up with the cannon-armed Jeff Francoeur over in right field and you may have one of the best throwing outfields in recent memory. The Braves certainly have high hopes that Kotsay will be able to fill in their center field void more than adequately – and that is really all anyone expects of him. Is Kotsay here to be the teacher? He boasts the most outfield of assists of any Major Leaguers since 1998 with 110. But teacher? Not necessarily. "Mr. Francoeur won a Gold Glove last year," quipped Kotsay. "What does he need to be taught?" Kotsay has already taken part in full work-outs, as Major League Baseball allows him that right as a player coming off an injury. Back injuries sapped Kotsay’s productivity a year ago (.214 with a homer and 20 RBI in 54 contests). Rushing his return to try and help the Athletics make their usual second half surge may not have been the best move in hindsight, but Kotsay feels that his back is now 100%. So now it’s time to get back to the business of winning for Kotsay and the Braves. As spring training approaches, it is time to take an in depth look at how the Braves are shaping up. Each entry will cover a specific portion of the club with a deeper look at how the positions and the battles to fill those final spots will shake out. Pitching always seems to be the first thing that comes to mind when it comes to the Atlanta Braves. Old habits die hard. For the first time in what was starting to feel like a decade, the Braves will enter a regular season with no shortage of capable arms and perhaps some to spare. That is not to say that they will be looking to unload any of it; quite the contrary. Atlanta finds themselves with a great mix of veteran hurlers and young guns who could propel the Braves into October for the first time since 2005. Perhaps no single pitcher is more synonymous with Braves baseball over the past 20 years than John Smoltz, the only man still with the club since the initial pennant winning 1991 season. Smoltz, has been in a constant state of evolution throughout his career, from young fire-baller to strikeout artist, to post-season ace, to Cy Young Award winner, to veteran stalwart, to dominant closer and then back again to anchor what looks to become an impressive Braves rotation in 2008. Yes, this rotation potentially boasts four former 20-game winners, non more on top of their game than the 40-year old Smoltz. Last season, his third back in the starting rotation, was the first time that Smoltz had to deal with a mid-season injury. The manner in which he was able to overcome that shoulder discomfort to continue to deliver quality starts and big performances for the club was mind-boggling to say the least. But then, that has come to be expected of Smoltz. The stats don’t lie. Smoltz went 14-8 with a 3.11 ERA in 32 starts last season, logging 200+ innings for the third straight year and pacing the club with 197 strikeouts. Smoltz provides the Braves a proven power pitcher who could match up favorably against the New York Mets recently acquired top dog, Johan Santana. Following Smoltz on the depth chart is 32-year old right-hander Tim Hudson, who bounced back from a nightmarish 2006 campaign. Hudson lead the team with 16 victories against 10 defeats and also logged a club-best 224.1 innings while making 34 starts. The Braves envisioned Hudson as the ace who would eventually receive the torch from Smoltz, having averaged 15 wins a season while with Oakland Athletics from 1999-2004, and last season was more along the lines they had envisioned when acquiring him in a trade prior to 2005. Hudson recommitted himself to his off-season training regimen, which had been derailed by a recurring oblique strain that forced the righty to miss time in both 2004 and 2005. With a full winter of training under his belt, Hudson exploded out the gate last season and would likely have pulled in 20 wins had not some late inning problems arisen in the Atlanta pen. Improved command lead to a career low 53 walks (for seasons in which Hudson logged at least 200 innings). Hudson’s re-imergence gave the Braves hope that they may only be a piece or two away from regaining the reputation of one of the better pitching clubs in baseball. The re-signing of veteran lefty Tom Glavine may represent that piece. Glavine is the exception to the rule in a number of cases. The saying goes, "You can’t go home again," but Glavine has proved that in actuality, "Never say never," may be more apropos. Glavine is not your typical soon-to-be 42-year old either. Last season, Glavine won 13 games and lead the Mets staff with 200.1 innings pitched, casting aside any doubt that Glavine has durability issues. In fact, Glavine has never visited the disabled list in his entire 21-year career. Though he may not be the same pitcher that departed for New York five years ago, Glavine has reinvented his style and made the necessary adjustments that have lead to his continued success. On August 5th, Glavine became the 23rd hurler in history to notch his 300th win and he brings an immeasurable amount of experience for some of the younger hurlers to soak up. While he may not be able to win 20 games for the sixth time in his career, Glavine gives the Braves a projected 200 innings that they were unable to account for last season. If there is one big question mark, it would undoubtedly be Mike Hampton. A healthy Hampton would be a huge boost for the staff, but that sight hasn’t been seen on the mound for Atlanta since early in the 2005 season. Recovered from two major elbow surgeries, the Braves have proclaimed Hampton healthy with absolutely no restrictions as he reports to Orlando in mid-February. The Braves hope Hampton, now 35, will be able to hold a spot in the rotation to add a veteran presence and another lefty. Hampton had really found a groove prior to having to undergo two reconstructive elbow surgeries, but the fact that he has not pitched in a Major League game since August of 2005 raised significant questions as to whether or not he will be able to make a return. A hamstring injury during his first start in the Mexican league this winter served to further curiosity as to whether Hampton will be able to hold up over a full season. A slightly less ambiguous candidate to secure a spot in the Braves rotations is fellow left-hander Chuck James. Over the past two seasons, James, 26, has shown flashes of brilliance mixed in with more than his share of abbreviated outings. An impressive showing as a rookie in 2006 saw James notch an 11-4 record, a win total that he matched a year ago. However, the Braves hope that improving his repertoire and command will allow James to work deeper into games this season. Atlanta also boasts a pair of young studs, a righty and a lefty, who could give James a run for his money. Newly acquired Jair Jurrjens, 22, arrives with high praise from many in the Detroit system. After going 3-1 in seven starts for the Tigers last season, Jurrjens was forced to the sidelines with some shoulder inflammation. Atlanta feels confident that Jurrjens is back to 100% and are expecting to see the young righty compete for a spot in the rotation. With both a four-seam (92-94 mph) and a two-seam fastball, a solid change and curveball, Jurrjens may continue to tinker with a slider under the guidance of Braves pitching coach Roger McDowell. The Braves got a good look at 21-year old Jo-Jo Reyes last season. While making 10 starts for Atlanta (and racking up an impressive 10-1 record at Triple-A Richmond), Reyes seemed to grow right before their very eyes. Shelled early on in his time with the big club, September was particularly kind to Reyes. His first big league win came against Florida on September 18 and was followed up by a win in his final start against Houston on the 28th. Despite the unimpressive 2-2 record and 6.22 ERA, Reyes could find himself in the rotation if he finds a way to cut down on his baserunners (55 hits and 30 walks in 50.2 IP). Late season call-up Jeff Bennett and well-traveled veteran Buddy Carlyle, both right-handers, will be invited to camp and will more than likely be kept around in the event of an injury. Still, one would have to think that if Bennett, 27, throws like he did in two September starts (1-1, 3.09 13 K in 11.2 IP) then he could make it very hard for Bobby Cox not to consider adding him as a long relief option at the very least. Carlyle, 30, went 8-7 in 20 starts (22 appearances) with a 5.21 ERA but those numbers do not underscore the valuable starts that the career minor league journeyman contributed in June and July before tiring down the stretch. The Braves may wish to keep Carlyle ready in Richmond with the glut of young guns looking to nail down a spot in the rotation, but he could find himself with an opportunity to contribute if history repeats.